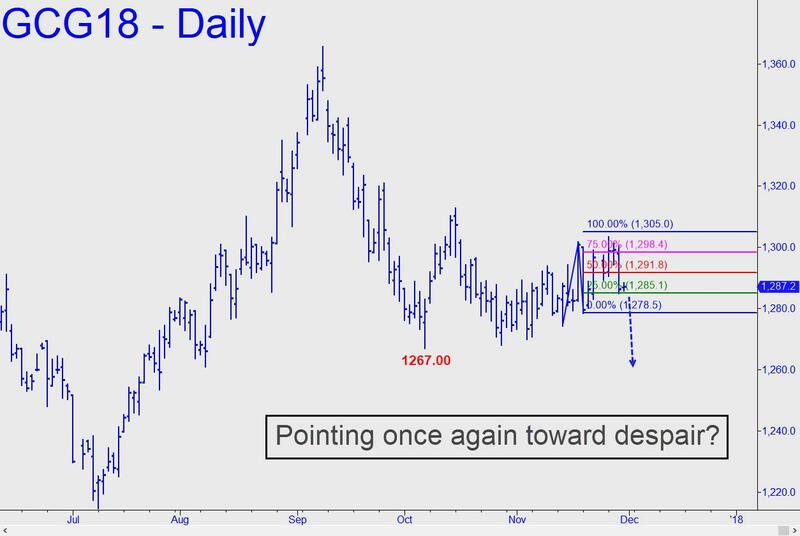 Bulls’ failure this week to achieve the 1305.00 Hidden Pivot target shown in the chart (click on inset) is not exactly a sign of robust health. Actually, the good guys needed to have done somewhat better than that, surpassing the 1312.70 peak from October 16, to show their seriousness. Instead, they died well shy of it; and, to make matters worse, relapsed on Wednesday to a new weekly low. The technical damage would begin to look serious if sellers push the February contract beneath 1278.50, the point ‘C’ low of the 1305.00 rally pattern. We’ve learned by now — all too well — that gold’s corrections are designed to bring bulls to the threshold of despair. By my lights, that would require a dip beneath mid-October’s 1267.00 low. We’d be feeling bullion’s pain by then, presumably just ahead of the next not-quite-satisfying rally.